Back from the break and Cesaro is out first. WWE Intercontinental Champion Kevin Owens is out next and we see a video from earlier where he talks about becoming a dual champion. Back and forth to start. Owens talks trash to Cole and Cesaro rolls him up for 2. Cesaro takes control but they come back in the ring and Owens turns it around. Owens talks more trash to Cole and Cesaro blocks his suplex with one of his own. Cesaro with a 2 count. Owens goes to the floor and pulls Cesaro out. He slams Cesaro’s face into the apron. Owens keeps trying to go in the ring but Cesaro pulls him back out and decks him each time. They both go down after colliding with clotheslines on the floor. They both make it back in at the 9 count as we go to commercial. Back from the break and Cesaro cranks up the uppercut train. Owens goes to the floor and looks like he wants to quit. Cesaro runs out, grabs a Cesaro Section sign, and nails a running uppercut against the barrier. They come back in and Owens rolls to the floor when Cesaro goes to the top. Cesaro runs down, across the ring and leaps off the apron onto Owens. Back in the ring, Cesaro nails a crossbody for a 2 count. Owens blocks the Swing and ends up hitting a DDT for a 2 count. Fans chant “this is awesome” now. Cesaro comes off the ropes with a big spinning uppercut. Owens blocks the Swing once again as Owens keeps using the ropes for protection. Owens suckers Cesaro in and nails a big kick. Owens with the pop-up powerbomb for the win. Owens advances to the main event. We go to ringside with Michael Cole, JBL and Jerry Lawler as fans are still filing into the Staples Center. They hype tonight’s show as Dolph Ziggler makes his way out to a pop. Cesaro is out next, followed by Neville and they both get pops also. 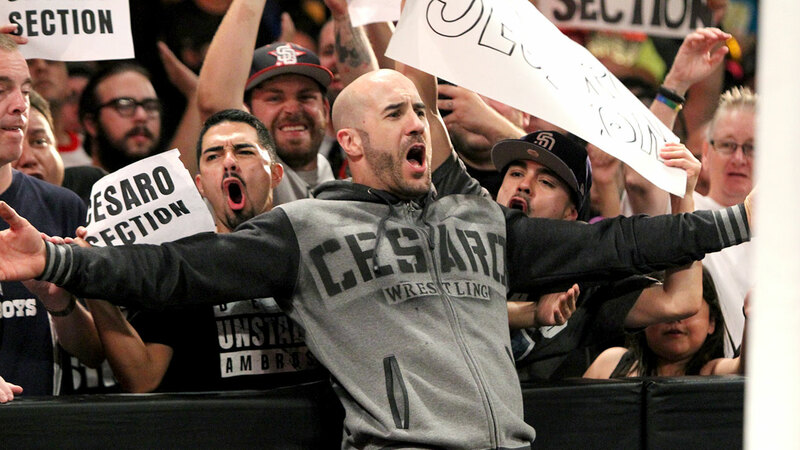 We see Stardust and The Ascension sitting in the crowd taunting Cesaro. Rusev is out first for his team. Sheamus is out last after King Barrett. Sheamus and Neville start the match. Sheamus takes him to the corner but Neville comes back with kicks. Sheamus side steps but gets dropped with an enziguri. Cesaro tags in to a pop. He slams Sheamus and drops to the mat. Neville does a corkscrew off Cesaro’s back. Cesaro covers Sheamus for a 2 count. Neville comes back in and Sheamus turns it around. Barrett tags in and beats Neville around, yelling at the referee. Rusev tags in and keeps up the attack on Neville. Rusev with kicks and a stomp. Sheamus tags back in and hits an uppercut. Neville fights back and counters a suplex. Ziggler tags in and unloads on Sheamus. Ziggler with a splash in the corner and a neckbreaker. Ziggler with an elbow drop. He nails Barrett and makes Rusev jump off the apron. Sheamus catches Ziggler but he turns it into a Fame-asser for a 2 count. Ziggler gets caught with a superkick while the referee is distracted and Sheamus covers for a 2 count. We go to break. Rollins and Cesaro lock up. Rollins tries to run away, but decides to go back into the ring. Cesaro knocks Rollins down with a series of uppercuts. Cesaro goes for the cross face, but Rollins rolls out of the ring. Rollins comes back in and gets caught in the Cesaro swing. Rollins once again goes outside the ring. 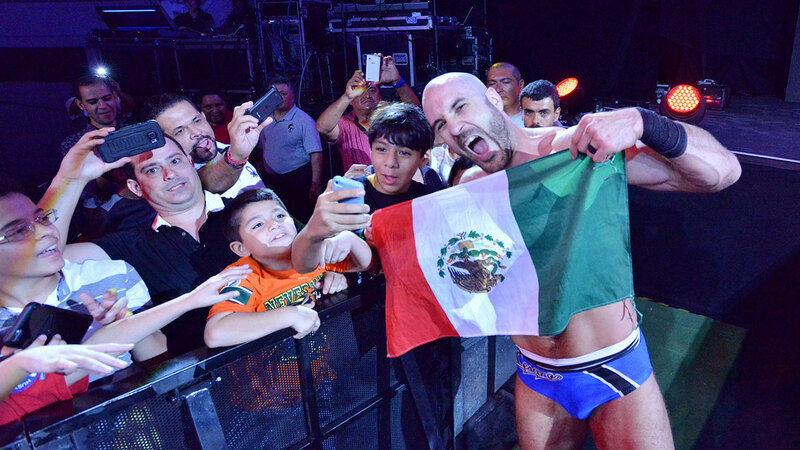 Cesaro catches up to him, but Rollins sends Cesaro rib first into the barricade. Rollins sends Cesaro into the steel ring steps. Rollins with a flying knee to Cesaro for a two count. Stardust and The Ascension appear in the audience with the Stardust section. Rollins stomps on Cesaro chest in the corner. Rollins with a running forearm to Cesaro. 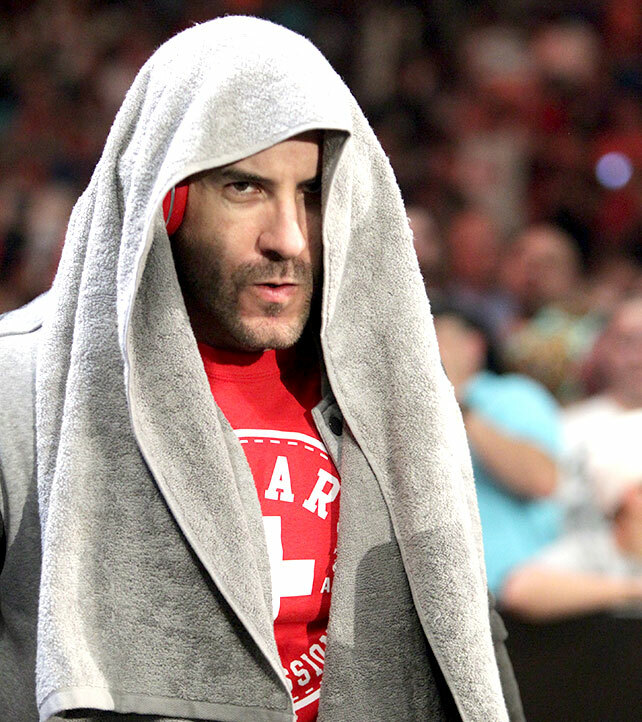 Rollins taunts Cesaro. Cesaro with a dropkick that sends Rollins off the top rope to the outside. Cesaro with the running uppercut that sends Rollins to the time keeper’s area. Cesaro rolls Rollins back into ring. Cesaro with a flying crossbody for a two count. Rollins is on the ring apron. Rollins goes for the sunset flip and Cesaro counters and tries to go for the Cesaro Swing and Rollins holds onto the bottom rope. Rollins with two kicks to Cesaro. Rollins dives off the top rope and eats a massive uppercut from Cesaro. Cesaro applies the cross face submission hold to Rollins. Rollins feet reach the bottom rope and Cesaro breaks the hold at the referee’s three count. Cesaro goes for a suplex and Rollins knocks Cesaro off the top rope. Rollins with the Pedigree to pickup the victory. We go to the ring and out comes Ziggler. 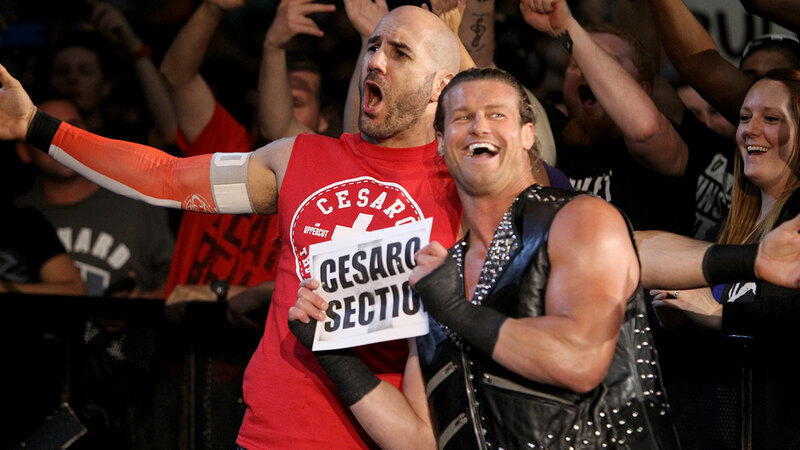 Cesaro is out next as Ziggler grabs a “Cesaro Section” sign and holds it up. Their partner Neville is out next. Back to commercial. Back from the break and King Barrett is out first followed by Rusev and then Sheamus. Rusev starts off with Neville and they go at it. Neville starts working on the arm. Neville with kicks. Rusev shoves Neville into the corner and splashes him. Rusev catches a crossbody but Neville lands on his feet and takes Rusev down. Neville with a big kick and a tag to Cesaro. Cesaro slams Rusev and takes control. He whips Rusev in the corner and tags in Neville before hitting a running uppercut. Neville comes in with a running splash and a 2 count. Sheamus gets a tags and goes at it with Neville. Sheamus floors Neville and tags in Barrett. Barrett works Neville over for a 2 count. Rusev tags back in and they keep Rusev down as fans chant USA. Rusev runs into an uppercut. Neville with more kicks. Rusev beats him down in the corner. Rusev runs into another big kick. Neville goes to the top but Sheamus distracts him. Neville gets knocked face first into the announce table. Sheamus runs over him as Ziggler and Cesaro come over and we go to commercial. Back from the break and Rusev has Neville down. Barrett comes back in and stops Neville from tagging. Barrett with a headlock now. Neville manages to dump Barrett over the top rope. Sheamus tags in and makes Ziggler and Cesaro jump off the apron before tagging. Cesaro finally gets the tag and knocks Rusev off the apron. He hits the running uppercuts in the corners on Sheamus. The uppercuts get a big pop. Cesaro hits a big boot and goes to the top for a crossbody and a 2 count. Sheamus blocks the Cesaro Swing. Cesaro knocks Barrett off the apron. Sheamus slams Cesaro. Barrett and Ziggler finally get the tags and go at it. Ziggler with a neckbreaker and a big elbow drop for a 2 count. Rusev runs in but Ziggler ends up dumping him to the floor. Barrett ducks the Fame-asser and rolls Ziggler for a 2 count. He comes back and barely hits the Fame-asser for a 2 count. Barrett blocks a superkick. Ziggler blocks Winds of Change with a 2 count. Ziggler nails a superkick for a 2 count as Sheamus breaks the pin. Cesaro knocks Sheamus to the floor. Rusev knocks Cesaro to the floor. Neville sends Rusev to the floor and then jumps out onto everyone. Ziggler rolls Barrett up for 2. Sheamus nails a Brogue Kick from the floor to Ziggler, who is leaned on the middle rope in the ring. Barrett takes advantage and gets the win. Back from commercial as Barrett is working over Neville. Sheamus tags in and works over Neville as Barrett hits some cheap shots. The suplex by Sheamus follows; he lays in some uppercuts and then tags in Barrett. Barrett grounds Neville with the chinlock. Neville battles to his feet, Barrett misses a charge and then misses a boot in the corner. Tags to Cesaro and Sheamus, Cesaro fires away with uppercuts in the corner and then starts to connect with the running uppercuts. A dropkick follows and then Cesaro takes Barrett out and send shim to the floor. Boot by Cesaro, to the floor and hits an uppercut on Barrett. Cesaro back in and hits the springboard uppercut for a near fall. Cesaro looks for the swing, but Sheamus pulls himself to the corner and gets the briefcase, Cesaro stops that but as the ref was removing the briefcase Barrett snuck in and hit the bull hammer on Cesaro, allowing Sheamus to pick up the win.